The following report was obtained from the website of the University of Washington. (U) The opioid epidemic continues to dominate headlines within the state and throughout the region. Powerful synthetic opioids, such as fentanyl and its derivatives, led to the overdose deaths of 70 individuals in Washington State during 2016 – more than twice the number of fentanyl-related deaths in the previous year. Although much of Washington’s focus is on curbing the opioid crisis, methamphetamine remains a critical threat in the Pacific Northwest. The regulation of recreational and medicinal marijuana continues to pose new challenges for law enforcement even as use of the drug in Washington State has been legal for several years. The reemergence of cocaine presents a unique threat to law enforcement and citizens in Washington State. 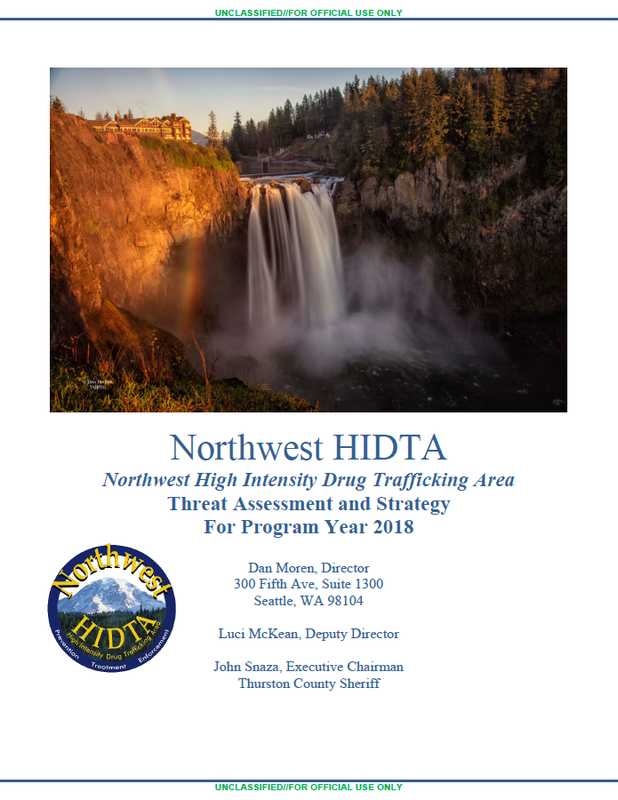 The Northwest High Intensity Drug Trafficking Area (HIDTA) Threat Assessment report combines law enforcement survey responses, reports from local health departments, and drug seizure data to assess the drug threats in Washington and creates strategies to address them. Northwest HIDTA is comprised of 14 counties across the state, enveloping law enforcement partners at the local, tribal, state, and federal levels, many of whom contributed to this report. 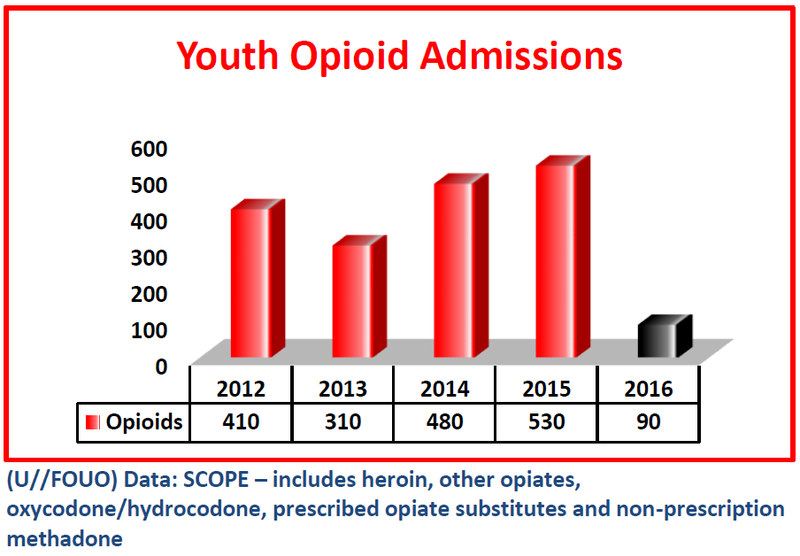 (U//FOUO) The number of opioid-related overdose deaths remains unabated in Washington State, with preliminary data for 2016 reflecting nearly 600 deaths where an opioid/opioids were found in the system, similar to that of 2011 through 2015 where opioid-related overdose deaths exceeded 600. Opioids pose a continued threat in Washington State, with opioid-related treatment admissions surpassing treatment admissions for alcohol in 2015. 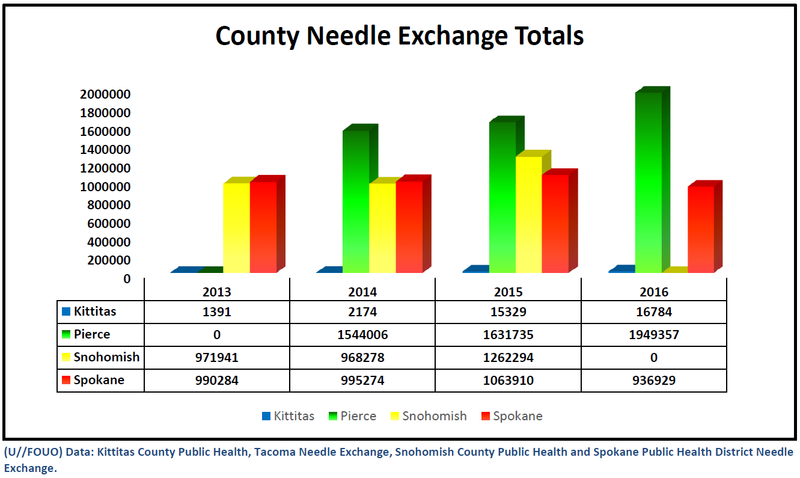 Heroin-related deaths and treatment numbers continue to reflect high or sustained use of the drug, and King, Pierce, Kittitas and Spokane Counties programs reflect a 19 percent increase in needle exchanges from 2014 to 2016. Naloxone (brand name Narcan ®), an opioid antidote, is easier to obtain in the state and several opioid-focused projects continue to address the heroin epidemic and look for solutions. In 2016, there were 70 fentanyl-related overdose deaths in Washington State, 63 of which involved another drug, most often benzodiazepine. Oxycodone (OxyContin ®) is considered by many to be a precursor to abusing heroin. In January 2017, Everett City Council filed a class action lawsuit against Purdue Pharma, the creator of OxyContin, alleging that the pharmaceutical company knowingly allowed its product to be sold through the black market. (U//FOUO) Adult methamphetamine treatment admissions are second only to heroin, and opioid overdose deaths involving methamphetamine increased 72 percent statewide from 2010 to 2015.1 The rise may be attributed to users combining opioids with methamphetamine when injecting. (U//FOUO) In 2016, Washington State’s Senate Bill (SB) 5052 went into effect and medical marijuana became subject to recreational marijuana regulation. While the state continues to adjust its marijuana laws, marijuana continues to represent 70 percent of overall treatment admissions for youth since the time of legalization in 2012. School suspensions have increased six percent and expulsions have increased 12 percent from the 2013-2014 to the 2014-2015 school year. The number of marijuana-involved DUIs are increasing with 38 percent of total cases submitted in 2016 testing above the 5 nanogram per milliliter of blood legal limit for those over the age of twenty-one. In addition, 10 percent of drivers involved in a fatal accident from 2010 to 2014 were THC-positive. (U) According to the 2016 National Drug Threat Assessment (NDTA), Colombia reported a record harvest of the coca plant in 2016. The South American country is US’s leading cocaine supplier and the increase could mean greater availability and falling prices for the drug in Washington. (U) MDMA is receiving attention nation-wide as it is being viewed as a potential treatment for post-traumatic stress disorder (PTSD). MDMA was approved by the Food and Drug Administration (FDA) in November 2016 for a Phase 3 study.